Mum, my sister-in-law, and almost sister-in-law arrived at my house Friday night, all ready and eager for a spa day on Saturday followed by lunch and a bit of shopping – a real girls weekend. We had a rather early start on Saturday morning because we knew that if we left it too late, we would have to queue for much longer at the Thermae Bath Spa. (Which, believe it or not, is actually on “Hot Bath Street”! It was glorious, we had two hours of sitting in the thermal waters or in the steam rooms. The great thing is that one of the thermal pools is actually an open air pool, and even better is that is it is a rooftop open air pool so you can sit in the warm water and look out over Bath!! It was a bit cold though so you really had to make sure that you sat well down in the water and not let your ears get too cold. ;-) The steam room were fabulous – there were four different large glass rooms with stone benches and they each had different aromas – lavender, eucalyptus, mint, and menthol – the menthol was just far too strong for me and my eyes didn’t like it, but it was lovely to sit in the lavender room and just sit and absorb the steam. After we’d dried off and were feeling quite invigorated and refreshed we went and had a look at the Royal – as seen above! It was a bit difficult to find lunch – we had intended to have lunch at Jamie’s Italian, but the queue put us off and so we just went and found a little place that was rather amusing cos they didn’t quite seem to have their act together, but the food was ok! In any case, we had a fabulous weekend and we would love to try and make this a regular event. Even if we don't, I have another spa weekend to look forward to in a couple of months and the future sister-in-law wants a spa weekend for a hen weekend!! at 21:09 8 comment(s) - click here to say something! I reckon that there must be no stranger experience than that of driving an unfamiliar car - I mean if you're driving it for just one day then you don't have time to get used to the dimensions of the car or how the brakes react and little things like that. Which certainly make parking a challenge - lets just say that I made sure that I parked away from the other cars and let them park around me!! Hey - I wasn't wonky, I just didn't want to ding any other car or even this one! While it was a weird experience, I did think that it was a nice little car and I did like the fact that it told me how many petrol miles I had left and how cold it was outside (1C - too cold!) - information that I don't get in my present car, so I am looking forward to having something like that when I eventually upgrade the car which is not happening any time soon. Addendum: it IS possible to take efficiency too far - I got home with newly serviced and MOT'd car only to find a reminder for said MOT on my doormat!!! at 21:14 5 comment(s) - click here to say something! Am just watching the opening scenes of the Welsh/English rugby match playing this afternoon and, while I don't know much Welsh, I just loved listening to the players and half the stadium sing the Welsh national anthem - it really stirs the blood. It stirs it in a way that the English national athem just doesn't - perhaps it's because I don't know the meaning behind the Welsh words, or perhaps the Welsh tune is just a better one - one that makes you want to stand up and sing as well (but I wont cos I couldn't carry a tune in a bucket!). It's probably the same reason why I love hearing the Welsh male voice choirs - they just sound amazing. When I listen to songs like "Men of Harlech" or "Myfanwy", I just get a tingle up my spine listening to those deep glorious voices - I am sure that there is nothing quite like it elsewhere. Good luck to everybody - may the best team win!! at 17:12 3 comment(s) - click here to say something! Warning – rather long post!! Well, today was an interesting day. I had the day off work because Mum arrived last night and we’re having a long weekend together! As it turned out, it was also the day of one of the repatriation journeys through my little town of Wootton Bassett; and it was also the day chosen for the Prince of Wales and the Duchess of Cornwall to pay a little visit to our part of the world! They did not come to the repatriation itself as that would not have been appropriate, but we went to see the last journey of those soldiers. Despite the fact that there have been many repatriations home (too many I should say), it was actually my first one as I am usually at work when the soldiers arrive home. The repatriation was very moving indeed, everyone gathers in the High Street and stands around chatting to each other while the press set up their cameras and whatnot. Then when the first police motorbike comes through, the Church bells start tolling and everyone falls silent – it really is quite an eerie moment. The black cars then come into the town and stop in the middle of the road where the soldiers are paid respect to by local people and other soldiers (both old soldiers and those still serving). It really was a very moving event – the mourning friends and family were on the other side of the road to us and there were two soldiers in battle fatigues and they were holding a single rose each (to place on the car) and then once they did they hugged each other and saluted the coffin in the car. It was just……..heart breaking. While I don’t particularly support the war because all war is such a cruel thing, I do think that it is nice that we can pay our respects to our fallen soldiers and offer up a public symbol of that respect through our town of Wootton Bassett. Anyway, about two hours later we were all stood around in the bitter bitter cold waiting for Prince Charles and Camilla to arrive and dedicate a new flagpole as a permanent reminder of that very support and respect that Wootton Bassett offer to the soldiers. While we were waiting we were entertained by the activities of everybody organising the event and the local marching band! 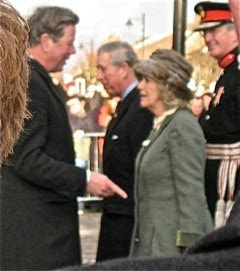 Finally….Charles and Camilla arrived and due to people being in the way of my camera I got some very very bad quality photos indeed as the camera was focusing on the wrong person!! But still, have a look at the photos below!! Update: Mum (using her lovely Mac) has managed to clean up one of my photos and it looks a bit better! at 20:54 11 comment(s) - click here to say something! ….is here!!! Go and visit A Whimsical Bohemian to find all those other blogs that are taking part in the annual One World One Heart. First of all, I wish a warm welcome to all of you that have stopped by my little blog on that OWOH Magic Carpet (I hope no-one’s fallen off yet!!) This little blog of mine has been going for about three years although last year was a bit of a slow year for blogging; hopefully I will do a bit better this year. Anyway, do feel free to have a rummage around my blog and find out a bit about me and my thoughts; and if you have a bit of time you could always have a peek at my other blog (Yet Another Card Blog) which is where I show the things that I make for my little hobby that I spend far too much money on – ha ha!! So, as One World One Heart involves giving something away.......what have I made that I am now going to give away?? A note card set that contains three cards…..
A birthday organiser “handbag” with a little pocket for stamps in the front…. And should I happen to make anything else between now and the 15th February, I might just offer that up as well. All you have to do is leave a single comment on this post only by the 15th February and I will draw three (or possibly more if I make more cards and things) names after 5pm British Time – please just make sure that I have some way of getting in touch with you (whether via your blog or an email address). Don’t forget that there are likely to be hundreds more blogs to have a rummage around, and if you want to offer up something yourself you have until the 7th February to check the OWOH webpage and find out what to do before sending your link to Lisa at A Whimsical Bohemian! at 18:14 276 comment(s) - click here to say something! Wow, it's been a week and a half and I am quite glad to have a whole day where I have nothing planned and nothing specific to do (aside from the usual house stuff that is!) You see, a few months ago, I decided that I was in danger of digging my rut deeper and deeper and not doing anything to climb out of it; and so I began to find other things to do, not to mention people to meet! Anyway, the silly thing is that I now feel that I have too much to do during the week!! Where on earth do you draw the line and find that balance of having too much to do or being stuck at home feeling as though you're turning into a hermit!? Mind you, this week just gone was a little unusual because I had three days at university and I think that if I hadn't had that travel to Bristol, then the whole week might not have been quite so tiring!! So....what did I do in the evenings? Monday night I was at my craft club making a cute little box of thank you cards, Tuesday night I was at a Pampered Chef party hosted by a friend (I bought some stuff! ), Wednesday night I went to the ballet with some other friends to see Sleeping Beauty (it was a strange little ballet! ), Thursday night I was off to my weekly sign language class - we are currently practising for our first exam which is next Thursday!! Friday was a relief as I wasn't doing anything in the evening, but I still had to work during the day. Saturday was fairly quiet, but I did go round to another friends house to take part in her craft afternoon - we made some lovely birthday reminder folders - you know the ones - where you can store birthday cards. In fact, I am quite likely to offer it up as part of the One World One Heart event which starts tomorrow. Anyway - I am sure you can see why I felt a bit too busy last week, and for some reason next week is going to be just as busy as I keep accepting invitations and finding other things to do. So, coming up this week is....Monday night is a free craft night as a friend is trying to increase her Stampin Up business; Tuesday night I have been invited to supper with a few friends; Wednesday night is tap dance (it's not on every week due to bookings in the hall), Thursday night is BSL exam night and Mum arrives for the weekend (yaaaay!). Friday - I actually have the day off work so that Mum and I can do stuff together - although I still need to go into work to get a blood test done (don't panic - nothing wrong - just a routine test) and the car is booked in to the garage for a service and MOT. at 12:02 3 comment(s) - click here to say something! I cannot believe how twitchy I feel - my legs keep bouncing and I just want to get up and walk or run or jump or something!! I suppose that is what happens when you spend the best of three days sitting solidly on your posterior!! I have just about reached the end of a stint at university doing one of the modules required for the MSc (strategic leadership) and even at work I don't spend quite so much time sitting down!! It may not feel like it, but I am actually quite often on the move at work - over there to talk to someone, over there to sort out the computer, or just to put some books away!! You just don't realise how much you DO move in the course of the day until you spend three says just sitting there!! My posterior is numb and I have had enough - it will practically be a pleasure to get back to work tomorrow!!! - Posted from my iPhone - please 'scuse mistakes!! at 15:16 3 comment(s) - click here to say something! I had great fun tonight down the local pub where they were hosting a Wassail – for those of you that don’t know what a wassail is – it is a gathering that generally involves lots of singing and alcohol! This particular wassail though was the Apple Wassail (traditionally held on the 17th January, which is the old 12th Night in the old calendar) where you’re supposed to dance in the orchards and offer a blessing to the apple trees. Well, we didn’t actually do that, but a potted apple tree was brought into the pub that we could sing to it! It’s all a bit pagan, but a heck of a lot of fun! My photos are pretty bad because they were taken using my iPhone and it was dark, but hopefully they’ll give you a flavour of what happened this evening – along with the choruses that we were expected to join in with – I did my bit!! and drink the winter away! And finally – the chorus of the Gower Wassail – and I have absolutely no idea what it means!! Sing too ral aye oh. at 21:20 4 comment(s) - click here to say something! The fabulous Lisa over at the Whimsical Bohemian is once again hosting One World One Heart aka OWOH. It began in 2007 with just under a hundred bloggers getting together to "meet" each other and share some amazing handcrafts; it is now in it's fourth year and we may just beat last years record of just under a thousand bloggers!! Click on the above picture to go to the OWOH website to find out more about the whole thing - over at the Whimsical Bohemian you can find out the ways in which you can participate in this fantastic event. It all starts on the 25th January and runs until the 15th February; so do come back on the 25th January when I will have an open house on my blog where I will welcome you all to my little part of One World One Heart and will have something to give away to one (or perhaps more!) of you lovely bloggers! at 19:47 1 comment(s) - click here to say something! I do have one problem already though - I don't seem to be able to add another blogger blog to blogpress lite as it doesn't like it! Has anyone else had any success there if you are using blogpress life for the iPhone? Edited to say that I have worked out how to add my card blog to my iPhone - it was just me being a bit dim!! ha ha!! at 08:47 2 comment(s) - click here to say something!